Home > News > Press Releases > The changing face of organic: How can organic extend its reach? 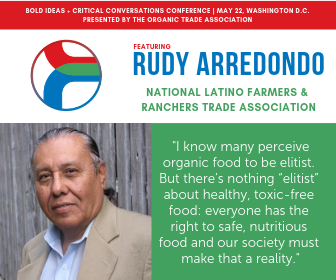 Longtime civil rights and rural activist Rudy Arredondo, President and CEO of the National Latino Farmers and Ranchers Trade Association, will be among the distinguished speakers at the Organic Trade Association’s 2019 annual conference looking at the changing face of organic, and how organic can adjust to meet the needs of all – consumers and producers alike. It’s a critical question for today’s organic sector: How can organic be accessible and affordable for more of our changing population and still fetch a fair price for its producers? Arredondo, along with a stellar collection of organic producers, community leaders and advocates in the health and wellness sectors will address that, and other important questions, at the Organic Trade Association’s “Bold Ideas & Critical Conversations” conference on May 22. Arredondo founded the National Latino Farmers & Ranchers Trade Association in 2004, and the group is now one of the largest Latino grassroots-based rural organizations in the United States. The group is a strong advocate of sustainable agricultural production methods, and Arredondo has been an impassioned voice in support of organic agriculture and the importance of organic for the health of farmworkers and consumers. The American population is evolving and shifting, and as it does, organic is finding its way into the kitchens of more households. But are the messages of organic changing enough to keep pace with our shifting population? In communities where fresh, healthful foods can be nearly impossible to source, where does organic fit into the conversation? As the organic industry grows and more consumers and retailers participate, how can we preserve the prices farmers need to continue to farm organically, while making organic available to many? “More Americans than ever before are eating organic, but organic needs to be sure it’s reaching everyone who wants to eat in a healthy and affordable way. We also need to ensure that our organic producers are getting paid enough to stay in organic. These in-depth discussions will address all these critical issues, and we are honored to have Rudy and our other respected speakers participating and sharing their thoughts,” said Laura Batcha, CEO and Executive Director of the Organic Trade Association. Three sessions dedicated to examining access and equity in the organic sector will be featured during the annual conference in the nation’s capital. The conference culminates Organic Week DC, three days of education, advocacy and networking sponsored by the Organic Trade Association. A session on “The Changing Demographic of Organic” will look at the demographic changes taking place in the U.S. population, if the organic industry is reflecting those changes, and how the sector can be more inclusive. The discussion will be led by Carlotta Mast, Sr. Vice President of Content and Market Leader, New Hope Network. Panelists include blogger Ari Adams, Executive Director, ShiftCon; Allie Mentzer, Advocacy Specialist, National Co+Op Grocers; and Delza Laxamana, Vice President of Brand Growth, NMI. A second session on “Urban Agriculture: Where does (and doesn’t) Organic Fit In?” discusses whether organic can be a part of urban farming, and what it will take to get there. Leading the discussion will be Stephanie Jerger, Community Outreach Director of the Baltimore Urban League. Panel participants include Arredondo; Xavier Brown, Director of Urban Agriculture, Soilful City; Katie Naessens, Professional Staff, U.S. Senate Agriculture Committee, and Cordelia June, Founder, Yon Vilaj. The third session on “Protecting Farmer Prices” examines the critical question of the economic health of our organic farmers, and how we can maintain a farm gate price that enables organic farmers to continue to profitably farm and still expand organic’s availability. Leading that panel will be Max Goldberg, Founder, LivingMaxwell.com, with panel members Doug Crabtree, Owner-Operator, Vilicus Farms; and Ariane Lotti, Owner/Grower, Tenuta San Carlo (invited). For more information on how to register for the Bold Ideas & Critical Conversations conference and on OrganicWeekDC, see this page. Leading Edge Thinking. Better Solutions. Bold Ideas & Critical Conversations.